Almost every day, I get e-mails and Twitter messages asking me about the effect of voter identification laws on turnout. Most of these messages, I presume, are from Democrats. They worry that more onerous laws, like those in Pennsylvania, could make it more difficult for Democratic-leaning voting groups like African-Americans and young voters to participate in this November’s election. These concerns are perfectly logical — although it is also possible to exaggerate the effects that these laws might have. Academic studies suggest that they very probably reduce turnout, but not by more than a couple of percentage points. And although Democratic voters may be more affected by the laws, some Republican voters will be disenfranchised by them, too. As I mentioned, there are quite a number of academic studies that seek to evaluate the effect of identification laws on voter turnout; John Sides has compiled a list of them here; or you can do some searching for yourself on Google Scholar. On the surface, these studies seem to disagree with one another about whether or not there is any effect on turnout from harsher voter identification laws. But if you read them in more detail, you’ll find that much of the disagreement is semantic rather than substantive. There is something of a consensus in the literature, in fact, about the rough magnitude of the effects. The stricter laws, like those that require photo identification, seem to decrease turnout by about 2 percent as a share of the registered voter population. Whether this effect is deemed to be “statistically significant” or not varies from study to study. It depends on what particular type of statistical test the researcher has applied, and how much data he or she is looking at. Statistical significance, however, is a funny concept. It has mostly to do with the volume of data that you have, and the sampling error that this introduces. Effects that may be of little practical significance can be statistically significant if you have tons and tons of data. Conversely, findings that have some substantive, real-world impact may not be deemed statistically significant, if the data is sparse or noisy. My view is that something which might reduce turnout by 2 percent in a key state is meaningful in a practical sense — at least if you looking at the election in a detail-oriented way, as we often do. Statistical significance tests start by specifying a null hypothesis. 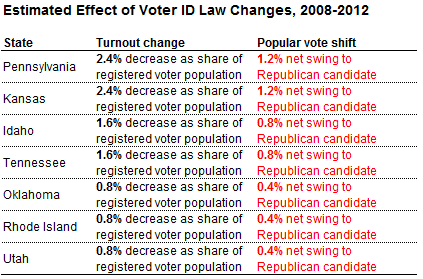 In the case of these studies, the null hypothesis is that voter identification laws do not impact turnout. Then it’s a question of whether the data is robust enough to persuade you otherwise. Some studies say that it is, and others say it isn’t. In other words, although the effects seem to be small, and although their precise magnitude is uncertain, the position that they don’t have any effect at all is hard to defend. The vast majority of adults do have some sort of identification. Many people who do not have identification are not registered to vote — or if they are registered, they are unlikely to turn out. The laws may be inconsistently enforced by thousands and thousands of poll workers at the precinct level. In many cases, voters without proper identification can cast a provisional ballot, which could eventually be counted in the event of a vote-counting dispute. The campaigns have an opportunity to educate their voters about ID requirements as part of their turnout operations. News media accounts, like some of those about the new voter ID laws in Pennsylvania, sometimes seize on the most dramatic estimates of the effects of these laws — rather than the most accurate ones. It has been reported, for instance, that about 750,000 Pennsylvanians, or about 9 percent of the state’s registered voter pool, do not have a ID issued by the state’s Department of Transportation. The 750,000-voter figure, however, includes some cases where there are database-matching problems: for instance, a woman is listed by her married surname in one database and her maiden surname in another may be included on that list, even though she should have few problems voting. It includes some cases of voters whose registrations are inactive. And it includes voters who will have some valid form of ID other than that issued by the Department of Transportation, like a passport, which would still make them eligible to vote. Based on the experiences of other states, it is more likely that these laws will prevent something like 2 or 3 percent of registered voters from actually casting a ballot, rather than 9 percent. Still, that could be meaningful depending on which candidate these voters would have chosen. None of the studies I mentioned have sought to measure how a decline in turnout could effect the Democratic and Republican candidates in particular, rather than the overall figure. But some implied that Democratic-leaning voting groups, especially African-Americans and Hispanics, were more likely to be affected. Others found that educational attainment was the key variable in predicting whom these laws might disenfranchise, with race being of secondary importance. If that’s true, some white voters without college degrees could also be affected, and they tend to vote Republican. Nevertheless, it’s clear enough that stricter voter ID requirements are probably bad for Democrats, on balance. In almost every state where the ID laws have been at issue, Republican governors and legislatures have been on the side of passing stricter ones, while Democrats have sought to block them. s a control, I looked at the party identification of all adults in the state in 2008, according to Gallup polling. This analysis suggested that for every one-percentage point increase in voter turnout, Barack Obama’s margin over John McCain increased by about six-tenths (0.6) of a point in 2008. Alternatively, I looked at the change in the popular vote margin between 2004 and 2008 as a function of the change in turnout. (For this version of the analysis, I excluded states that were the home state of any of the presidential or vice presidential candidates in 2004 or 2008, since this introduces noise related to native-son effects.) This version indicated that a 1-point increase in turnout increased Mr. Obama’s margin over John McCain by about 0.4 percentage points in 2008. Both of these estimates are crude — I am open to looking into more robust means of estimating these effects, in case any of you have ideas. But they square with the general notion that higher turnout is helpful to Democrats, on balance. If you take the average between them, it suggests that a 1-point increase in turnout would improve the Democrat’s margin in the popular vote by a half a percentage point, accounting for other factors. I then looked at which states have changed their voting laws since 2008, according to the National Council of State Legislatures. Their Web site classifies states along a 4-point spectrum from having no voter ID laws to strict photo identification requirements. Pennsylvania, for instance, went from having no voter ID laws to a strict photo ID requirement. Based on the academic studies, I estimate that this will reduce turnout by about 2.4 percent as a share of registered voters. And based on my formula to convert changes in turnout to changes in the popular vote, I estimate that this would reduce President Obama’s margin against Mitt Romney by a net of 1.2 percentage points. Changes for other states are listed below; I exclude cases where changes in a voter ID law have been struck down by courts, or are pending approval by the Department of Justice. Note that, other than Pennsylvania, no swing states have passed major changes to voter ID laws, although others like Wisconsin have sought to pass laws that have been struck down. Starting with Saturday’s forecast, these shifts are applied to the “state fundamentals” calculation that the FiveThirtyEight forecast model uses along with the polls in each state. The state fundamentals calculation is based on large part on how the state voted in 2008 or 2004 — so if there have been changes in the fundamentals since that time which we think might have predictable effects, it is worth accounting for them. I do not apply any adjustment to the polls themselves. My notion is that the pollsters are responsible for accounting for these effects, such as by means of their likely voter models or their mechanism of accounting for registered voters. One last thing to consider: although I do think these laws will have some detrimental effect on Democratic turnout, it is unlikely to be as large as some Democrats fear or as some news media reports imply — and they can also serve as a rallying point for the party bases. So although the direct effects of these laws are likely negative for Democrats, it wouldn’t take that much in terms of increased base voter engagement — and increased voter conscientiousness about their registration status — to mitigate them.